The invention of the airplane has attracted the attention of several grand historians. Among the finest is Sir Charles Gibbs-Smith. Most of the information presented in this site was assembled by Gibbs-Smith. Gibbs-Smith, C. H. (1966). A Directory and Nomenclature of the First Aeroplanes 1809 to 1909. London: Her Majesty's Stationery Office. A listing of early gliders (to 1903) and powered craft (from 1903-1909) arranged alphabetically by inventors. Gibbs-Smith, C. (1966). The Invention of the Aeroplane, 1799-1909. London: Faber & Faber. Out of print. A year-by-year, craft-by-craft account. The only fault I can ever find with Gibbs-Smith is that he frequently employs expressions like "made a brief hop" for a flight. How far is a brief hop? Sometimes I've found out after years of looking, but usually the answer is 'nobody knows'. Gibbs-Smith, C.H. (1968). Clement Ader His Flight-Claims and his Place in History. London, Her Majesty's Stationery Office. A long and painstaking discussion of Ader's lies. Sometimes history passes people by, whereupon they get jealous, and make outrageous claims. Pitiful. It becomes obnoxious when others exploit the lies for their own purposes. Gibbs-Smith, C.H. (1974). The Rebirth of European Aviation 1902-1908. London: Her Majesty's Stationery Office. Out of print. Hallion, R. P. (Ed.) (1978). The Wright Brothers: Heirs of Prometheus. Washington, DC: The Smithsonian Institution. Out of print. 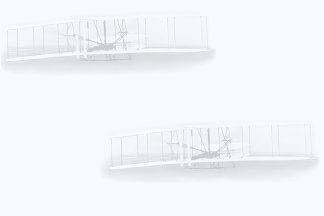 Go to the Bibliography covering the Invention of the Airplane.